The Most Explosive Pre-Workout Ever! Limitless combines all the benefits of a highly stimulatory pre workout but without jitters or that nasty crash we are all too familiar with. Unsatisfied with the numerous “micro-dosing” preworkouts we have seen in recent years, yielding high stim jittery energy while lacking sufficient dosing of key ingredients to provide a mind blowing pump; we said “enough is enough”. 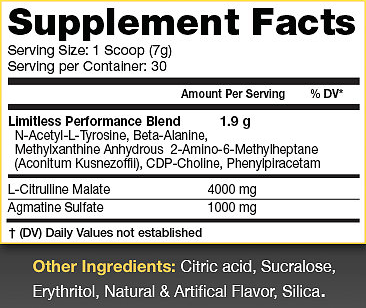 Combining our unique stimulatory Nootropic Blend with a solid 4g of L-Citrulline Malate and 1g of Agmatine Sulfate; Limitless leaves you with not just an enhanced mind-muscle connection for ultimate muscle contraction; but skin splitting, nutrition delivering, mind blowing pumps on top of it all! A true Performance Enhancing Pre Workout… A feel that cannot be compared. As a dietary supplement, drink 1 scoop mixed with 8-10 oz of water 15-30 minutes before training. Users may begin using 1/2-3/4 scoop to asses tolerance.